The Cow Palace of San Francisco, CA is known for the Grand National Rodeo. 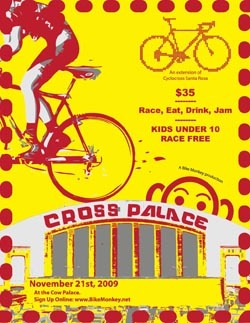 On November 21st 2009, the Cow Palace will also been know for the inaugural Cross Palace hosted by Bike Monkey Magazine. One of the featured events of the SF Bike Expo. It will be a one of kind course. It will route in and out of the expo area and down to through the corrals, horse area and finish in the Expo. Bike Monkey Magazine is a new niche cycling organization that publishes a quarterly magazine with a very unique spin on the cycling culture making Bike Monkey the perfect fit for hosting Cyclocross Racing at the SF Bike Expo. Register today! B. Spoke Tailor - Oakland, CA. Local clothing maker creates wool knickers, custom bicycle suits, rain coats, and more. The best in modern riding apparel. For the bike. You can ride a horse in our clothing if you are lucky enough to have one. Or hike, or play..
Renovo Hardwood Bicycles - Portland, OR. The smoothest bike you'll ever ride, stealth quiet, light and responsive, stiff as you want. Renovo hollow wood and laminated bamboo frames will forever change your understanding of what a bicycle should be, and how these natural materials can perform when designed to their strengths. The Hive - Petaluma, CA. Established in 2008, The Hive is committed to improving cyclists experience through the relentless application of engineering and design principles. They recently released their Fifteen.G cranksets to rave reviews. The roots of The Hive brand were set in place by years of personal experience as cyclists and members of the cycling industry. FOX Racing Shox - Watsonville, CA. For 35 years, FOX Racing Shox has been the industry leader in design and development of high performance shock absorbers and racing suspension products in snowmobiles, mountain bikes, motorcycles, ATV's and off-road cars and tracks. Nutcase Helmets - Portland, CA. Multi-purpose cycle, skateboard, inline and scooter helmets aimed at providing unique designs and creative alternatives in the cycle and skate helmet market. Launched in the spring of 2005, their designs are original, unique and very imaginative. The objective of Nutcase helmets is to combine highly visual graphics with multi-purpose helmet designs that are popular among bicycle, skateboard, scooter and in-line skate enthusiasts. Follow the progress of the SF Bike Expo on www.SFBikeexpo.com, Facebook and Twitter.